The <em>L.A. Times</em> reporter Ken Weiss. Carpinteria resident Ken Weiss, winner of the 2007 Pulitzer Prize, was a brilliant fisherman as child, or so he told an audience at UCSB’s Corwin Pavilion on Saturday, April 29. His luck diminished as he grew older, but the reason for this reversal of fortune didn’t fully dawn on him until he started covering the coast and oceans as a reporter for the Los Angeles Times. Just as he had wondered where all the bonita and barracudas had gone that he used to catch so easily, Weiss listened to frustrated marine biologists give report after report on the increasing scarcity of organisms and ecosystems they were trying to study. Scientists were putting their jigsaw puzzle pieces of the ocean together and coming to chilling conclusions about the reverse evolution of the oceans away from larger organisms, toward a more primitive soup dominated by algae and bacteria. Weiss’s talk focused not so much on how he got the story as how he managed to sell it to his editor and the public. Too many environmental stories are based on “future or conditional threats,” he said, so they take a back page to events happening at the moment – from Middle East explosions to celebrity weddings. 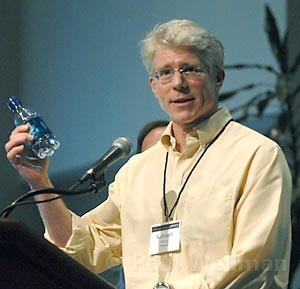 “So I’m waving a new inch-thick report on the infighting over setting limits on bacteria in coastal waters – with the awful name, Total Maximum Daily Load, and worse acronym, TMDLs – and this is what I’m up against,” Weiss told the audience. Making matters worse, there is not even a convenient villain to blame, he said: no corrupt official, no chemical company illegally dumping waste, not even a balky government agency. Weiss credited editor Dean Baquet (who was “dismissed along with our publisher last year for standing up to our corporate bosses pressing for more layoffs”) for letting him pursue the story, which he worked on for the better part of 18 months. The way he made it interesting was to document – with photographer Rick Loomis, who carried both a still and a video camera – the effects already being wreaked by the change in the sea. Closer to home, they visited marine mammal rehabilitation centers populated by brain-damaged sea lions, a pathetic scene. The animals’ hippocampuses were shriveled by domoic acid, a neurotoxin produced by an algae now blooming in unnatural quantities off the California coast. This week, California Fish and Game officials warned people not to eat shellfish, sardines, or the internal organs of crustaceans because of the risk of domoic acid poisoning. Dozens of other toxin-producing algae species are burgeoning in coastal waters all over the world. The cause, according to Weiss, is the plant nutrients washing into the seas from agricultural fields, gardens, and sewage treatment plants. This is exacerbated by the removal of fish and wetlands that function as natural filters. And then there is the acidification of the seas, which threatens shell-formation, which relies on the seas’ alkalinity. Horror stories, to be sure, but these are meant to be inspiring rather than depressing, said the conference’s emcee. And they succeeded thanks largely to the dedication of the scientists who are grappling with the situation, which has a certain heroic charm that the series also demonstrated. Weiss has reason to be familiar with that quality: He is the brother of Nancy Weiss, the distinguished Santa Barbara environmental and social justice activist. Weiss has done follow-up stories since the series, including at least one examining market-based solutions to the problem. He said it’s easier to write compellingly about problems than about solutions.